Sophomore broadcast journalism major Nicole Barros has never liked cardio. When going to the gym during high school with her mom, she hated using the treadmills and wished there was something more for girls to do to be toned. Looking at the guys lifting in the gym, she felt it wasn't a safe thing for her to try on her own. Fast forward two years later to her freshman year at Penn State, where she happened to go to the gym one day with one of her good guy friends who decided to lift that day. Using him as an excuse to be in the weight room, he taught her the basics and she fell in love at first lift. That day, she was approached by the national champion in squats, telling her that she should join the team. 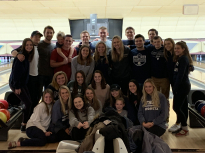 Barros was extremely hesitant as this was a "man's" sport, but realized -- after doing some online research -- that the Penn State powerlifting team was made up of both men and women. The powerlifting president Sarah Cruz-Ortiz, Barros' team mentor, is a woman that can lift almost three times her own weight. The message of the team -- which is now comprised of around fifteen to twenty girls -- is to spread the word that girls can lift too. The powerlifting team practices in Penn State's White building. Their program requires a mandatory Sunday evening practice and an additional two days of lifting during the week. Barros' team competes once a month against a team from another school. The Iron Lion meet was the first competition for Barros this season. Each lifter has three attempts to lift the most weight while doing squats, deadlifts and bench press. At the meet, three of Barros' teammates qualified for nationals this spring in Georgia. Barros just started using a belt while squatting to help her keep increasing the amount of weight she is lifting. Her best lifts to this date are 185 pounds while squatting, 90 pounds for bench press, and 200 pounds for deadlift, which she says is easiest for her. Barros says her favorite thing about the team is the support they give one another, especially since lifting is such a mental sport, and looks forward to the team helping her to victory.